Seeding Starts, a photo by NurseLovesFarmer on Flickr. I took this picture on Saturday May 7 as the guys were starting to seed the field above the farm. They actually got out the night before, which is pretty amazing with all the moisture we’ve had. But the Chinooks turned on the big blow dryer in the sky and it’s sure helped out! 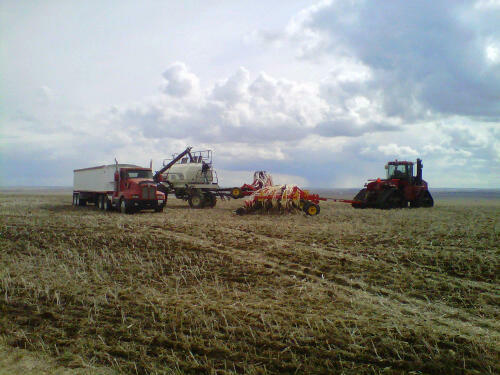 We had quite a lot of rain on Sunday but they’re out going strong, seeding their wheat!